What is the girl's name, anyway? Honestly, I don't know. Unless She is actually named "Dabima", as her necklace suggests, it would be safe to assume that the necklace is misspelled. If I had to guess, I'd say "Rebecca", though a terribly misspelled one. Now look at the tattoo., see how much worse than the necklace it turned out. Every single letter is misshapen somehow. Several even morphed into entirely different letters. 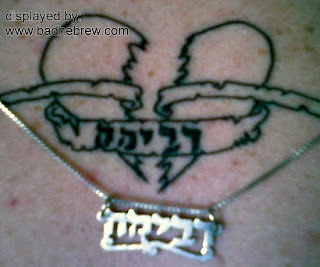 Using your jewelry as a template for a Hebrew tattoo - bad idea. Using misspelled jewelry - even worse! Don't do it kids, it's just not worth the grief! i thought Judaism frowns upon tattoos? Judaism does frown upun tattoos, but these tatoos could be God's punishment for tattooing. Maybe it's supposed to be a transliteration of "dreamah" (dreamer), with an underline under the resh for some reason. I have such a tattoo like this ללא חרטה), is it right or we need to fix it? Thanks a lot!!! !